The inauguration comes weeks after Brazil rejected Israel’s ambassador, a former leader of West Bank settlers. 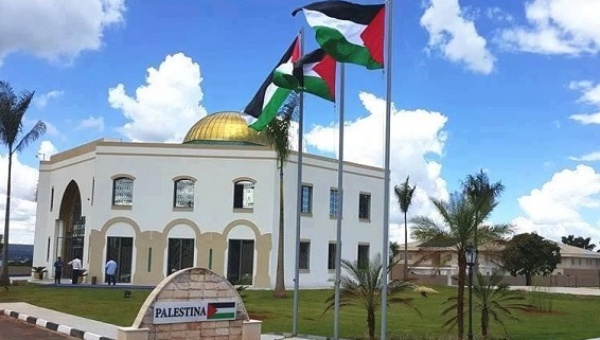 The Palestinian Authority inaugurated its first embassy in the Western Hemisphere in Brasilia Wednesday amid a diplomatic row between Brazil and Israel. Representatives of Arab countries and Arab Brazilians attended the event, hosted on land donated to the PA by former Brazilian President Luiz Inacio Lula da Silva. The Brazilian government — long openly supportive of Palestine — last month rejected Israel’s appointment for envoy, a former leader of West Bank settlers who are illegally occupying Palestinian land. The announcement came a year after the previous envoy was sent and without prior communication with the Brazilian Foreign Ministry. Palestinian diplomats lobbied against Israel’s pick and Israel has refused to select another, chilling relations with Brazil. The Palestine Liberation Organization has sent representatives to Brazil since 1975, and a special delegation has served as de facto embassy staff since 1998. Alzeben expressed his hope for a Brazilian embassy in Jerusalem during the ceremony; it already has one in the West Bank city of Ramallah. Alzeben said he also hopes to secure a free-trade agreement with countries of Mercosur, the South American trade bloc. Israel signed a Free Trade Zone Agreement with Mercosur in 2007 and Brazil is its largest partner in Latin America.